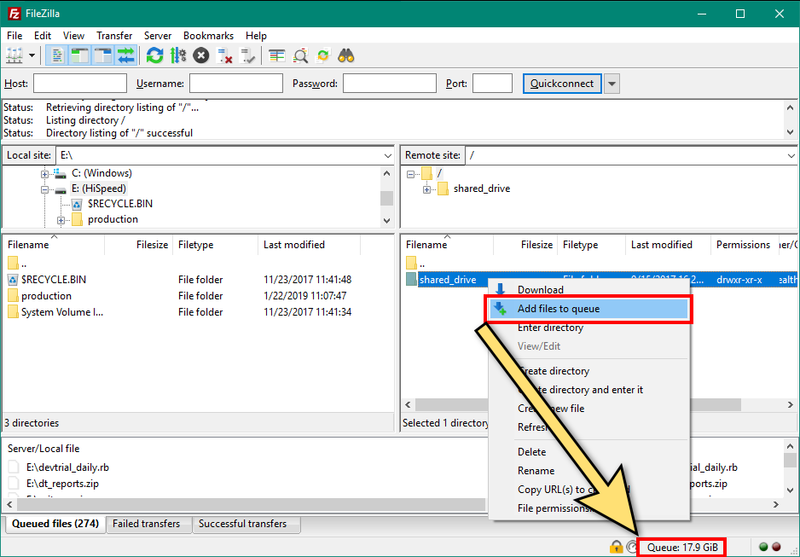 This article describes several ways to check the current usage of the shared drive from a VM or from an FTP client. Any Skytap or administrator can perform these actions. By mapping the shared drive as a network drive, you can see the total drive capacity and how much of the capacity is in use. The mapping process differs between Windows versions. Click the Map Network Drive button along the upper edge of the window. Choose an appropriate drive letter (such as “F:”). For the Folder field, enter \\gw\shared. View usage from smbclient or Nautilus on a Linux VM. For more information about installing these tools, see Adding and sharing files with the shared drive. Type du to display the current usage of the shared drive, as well as its total capacity. To display current and total use, view the folder properties by pressing Alt + Enter. How you determine usage via FTP depends on which program you use. Most programs display only the size of files within a selected directory—not the contents of subdirectories. You can view the total size of a directory and all of the files in its subdirectories by temporarily adding them to the FTP client transfer queue. To temporarily add all files to the transfer queue, right-click the shared_drive directory and select Add files to queue from the menu. The FTP client displays the combined size of all the files in the transfer queue. To clear the transfer queue, right-click in the transfer queue at the bottom of the FTP client and select Stop and remove all. You can’t add files or folders to the transfer queue unless you are connected to an FTP server. Some FTP clients may report file sizes in kibibytes, mebibytes, etc., rather than in kilobytes, megabytes, etc. Administrators can find the maximum capacity of the shared drive from the Admin > Settings page. For more information, see Managing account-wide settings.